reducing data costs and delaying the need to upgrade existing links. The service helps schools deliver richer content in class, provide complete flexibility to teachers and enhances learning outcomes for students. 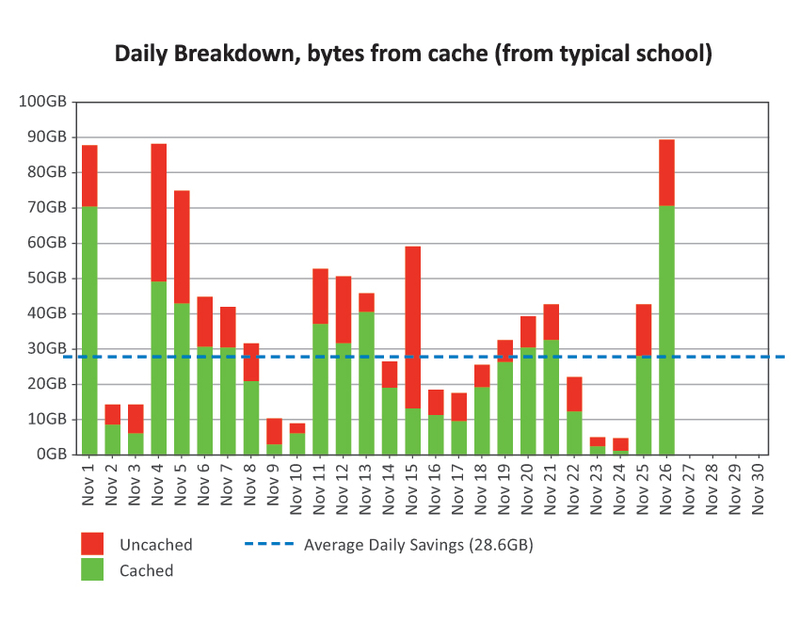 In one day we served 1.65TB of data from the CyberHound Cache – this gave massive benefits for the school – a great product. CyberHound is able to cache large files used by schools through one simple interface tool. The Large Object Cache seamlessly scans the school network for files to cache including e-books, Microsoft and Adobe software updates, YouTube, iOS updates, App Store downloads and much more! We have seen excellent results from the unique CyberHound caching services. We are serving 70-80% of all internet data from cache – saving about a 50Mbp/s internet link – we are getting great value. The Centre for Learning and Performance Technologies has ranked YouTube the top critical learning tool – proving the need for reliable, fast and inexpensive access to this content in schools. YouTube content typically consumes 30-70% of a school's overall internet data usage (without caching). After caching this is reduced to 5-10%. CyberHound’s YouTube Cache supports over 265 separate formats of YouTube videos. It also supports multiple browser versions and operating systems. Pre-caching allows a teacher to prepare for a lesson and ensure immediate optimal access. Real-time caching service delivers content to other users as soon as a YouTube video is being viewed by another user – i.e. the whole video does not have to download to the first user for the benefits to be seen. CyberHound enables schools to leverage YouTube in the classroom while maintaining safe access policies and ensuring reliable access to videos.